To find a replacement parts for your dryer, search http://www.repairclinic.com/Shop-For-Parts using your appliance’s model number. Your dryer vent pipe should be made of aluminum. The white vinyl duct that was common several years ago no longer meets most building codes, because if your dryer ignites it, a fire may start in your home. Check the entire length of the vent pipe for lint build-up at least once a year–or more often if the dryer gets a lot of use. Note… Remove the lint from the duct–don’t just push it back into the dryer or let it clog any part of the vent. You can tackle lint build-up in the duct with our Vent Brush for Cleaning 4″ Round Dryer Vent accessory. It’s available in 10 foot and 20 foot lengths. The lint produced by clothes tumbling in a dryer is normally trapped by the lint filter. However, some lint invariably escapes and accumulates on the inside of the dryer cabinet. At least once a year, check the inside of the cabinet, and clean it if necessary. Do this more frequently if the dryer is used heavily. Check and clean the lint filter after every drying cycle. If the lint filter has any rips or tears, replace it. If the filter gets clogged by fabric softener residue or any other residue, you can easily clean it with a soft-bristle brush and a little detergent. 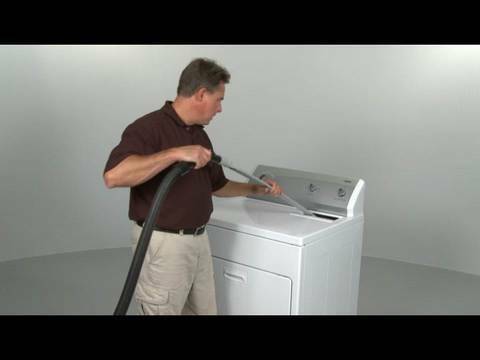 You can also clean the chute, duct, or area that the lint filter fits into. If necessary, use a vacuum cleaner to reach into the duct and clean out any lint. Note… If the lint build-up is severe, it’s important to disassemble the dryer and clean out the lint more thoroughly. This is often a job for a qualified appliance repair technician, because there’s a risk of injuring yourself or damaging the machine.